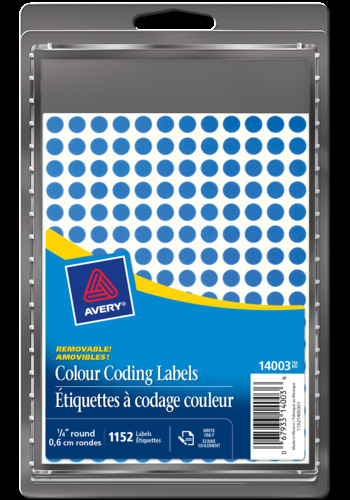 Removable Colour Coding labels are the ideal tool for keeping track of files, inventory, scheduling and more. Colour coding labels stick firmly to help you identify files or documents, price sale items, make your calendar come alive and more. Removable Colour Coding labels are the ideal tool for keeping track of files, inventory, scheduling and more. Colour coding labels stick firmly to help you identify files or documents, price sale items, make your calendar come alive and more. The labels are removable so they stick around only as long as you want them to. When you no longer need them, the labels peel away cleanly. Since they're great for document and inventory control, routing, organizing, highlighting, price marking and scheduling, you'll enjoy extreme versatility.